How cute is this backpack? Kate Eastwood has created a miniature version of her gorgeous backpack for the little people in your life! Ladybird, Ladybug, fly away home! Following on from my adult sized ‘Out and About’ Backpack – how about one for the littlies in your life too! Whether it’s used for a day out in the park or packed up and taken to nursery this little backpack is the perfect size. The measurements of the finished backpack are approx. H 28cm x W 26cm x D min. 8cm. The back pack straps could be made longer or shorter if needs be by adjusting the chain length. The back pack is designed to have a flap over top, under which is a drawstring tie and there is a small carry handle at the top of the backpack , as well as two shoulder straps. I used two balls of Hoooked Eco Barbante for my backpack in Ruby 1000 using a 3.5mm hook. This yarn is perfect for a bag as it creates a really strong, un-stretchy texture that will allow your bag to keep its shape. 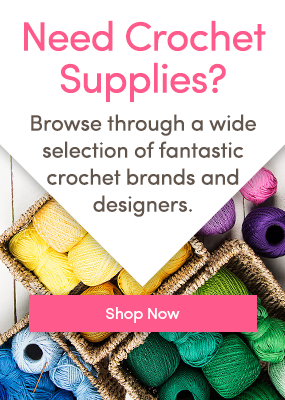 The tutorial is written using UK crochet terminology – to convert to US, you can use our handy conversion tables! You will also need approx. 75cm of cord for the drawstring, a toggle for the drawstring (optional) and a popper to fasten down the flap ( optional ). For the ladybirds you will need some small amounts of red and black DK yarn, a 3.5mm hook, stuffing, some 4.5mm safety eyes and some black embroidery thread. For the ladybirds spots I used some small black sequins, but these could be embroidered on if preferred. Round 1: Starting in the second chain from the hook work 3 DC in to the same stitch. Work a DC in to each of the next 23 stitches and then work 3 DC in to the last stitch. You are now going to continue on round by working down the other side of the chain. So, continuing on round, work a further 23 DC, then join with a SL ST in to the first stitch. Round 2: Chain 1 and work a 2nd DC in to the same stitch. Work 2 DC into each of the next 2 sts. DC 23. Work 2DC into each of the next 3 stitches, DC 23 and then SL ST to join. 58 sts. Round 3: Chain 1 and work a DC in to the same stitch. Work 2 DC in to each of the next 4 stitches. Now work the following: 4 DC, 4 HTR, 9 TR, 4 HTR, 4 DC. Work 2 DC in to each of the next 4 sts. Work along the other side as follows: 4 DC, 4 HTR, 9 TR, 4 HTR, 4 DC. SL ST to join. 66 sts. Round 4: Chain 1 and work a DC in to the same stitch. Work a DC in to each of the next 2 stitches, then 2 DC in to each of the next 3 sts, work a DC into each of the next 2 stitches and then work the following: 4 DC, 4 HTR, 9 TR, 4 HTR, 4 DC. Work a DC in to each of the next 2 stitches, 2 DC in to each of the next 3 sts, and then a DC in to each of the next 2 sts. Now work the following : 4 DC, 4 HTR, 9 TR, 4 HTR, 4 DC and finish the round by SL ST to join. 72 sts. Round 5: Chain 1, work a DC in to the same st and work DC all the way around. SL ST to join. 72 sts. You are now going to start working on the main body of the bag, but first you need to lay your base piece wrong side down and mark 28 stitches along one edge, using stitch markers. This will be the back edge of the base , the rest of the stitches ( 44 sts) will be the front part of the backpack and we will be increasing in to these stitches to give the bag its shape. You should now be able to see that you have a straight back edge to the base and then a curved shape to the front edge of the base. You should now have 94 sts. Continue working in rounds ( 94 sts) until your work measures approx. 24cm from the straight edge of the base to the top. Finish off and sew in ends. In the next 2 rounds you will be making the holes for the drawstring tie, so start by placing your two stitch markers on the back of the bag, to mark the beginning and end of the flat edge (28 sts). CH 2 and skip 2 stitches, DC 4, CH 2 and skip 2 stitches, DC 4, CH2 and skip 2 stitches, DC 3, CH2 and skip 2 stitches, DC 2, CH 1. This will have taken you to the centre of the front. Continue working the round, working the buttonhole pattern as follows: CH1, DC2, CH 2 and skip 2 sts, DC 3, CH 2 and skip 2 stitches, DC 4, CH 2 and skip 2 sts, DC 4, CH 2 and skip 2 sts. Work 28 DC, which will bring you back to the first stitch marker. The next stage is to make all the add on pieces. Row 1: Starting in the 2nd chain from the hook work 2 DC in to the first st, DC, then work 2DC in to the last stitch. 10 sts. Ch 1 and turn. Row 2: DC 2 in to the first stitch, DC 8 , DC2 in the last stitch. 12 sts. Chain 1 and turn. Row 3: DC 2 in to the first stitch, DC 10 , DC 2 in the last stitch. 14 sts. Chain 1 and turn. Continue working this pattern until you have 28 stitches. Continue working rows of DC, remembering to ch 1 and turn at the end of every row until the front flap measures 18cm from centre bottom to centre top. Finish off and sew in ends. For the second border row work a round of Rope Stitch, this is DC but worked clockwise instead of the usual anti-clockwise. Row 1: Starting in the 2nd chain from the hook work 2 DC in to the first st, DC, then work 2DC in to the last stitch. 8 sts. Ch 1 and turn. Increase as for the front flap until you have 16sts. Work a further 8 rows of DC, remebering to ch 1 and turn at the end of each row. Finish off and sew in ends. Using the cream yarn and a 4 mm hook work one row of DC along the top edge. Using the cream and a 4 mm hook chain 25. Beginning in the 2nd chain from the hook work a row of DC, at the end of the row ch 1 and turn. Work a further 9 rows. Finish off and leave a long yarn tail. Now fold the handstrap in half length ways and join the two edges together with a row of DC. Finish off and sew in ends. To make the shoulder straps: Make 2. Chain 76, and starting in the second chain from the hook work 7 rows of DC, remembering to chain 1 and turn at the end of each row. Finish off and sew in ends. Rejoin your yarn back at the beginning of the first row of cream and work a row of Rope stitch, as for the front flap. To finish your bag, pin your hand strap and shoulder straps on to the back of the front flap. I found it quite helpful to mark the central point of the flap so that you can get the straps evenly placed. Using a needle and some strong thread sew the straps in to place. For your second round work the same rope edging as before. Stitch the bottom of the shoulder straps to the base of the bag, just above the cream edging. Using the black yarn make a Magic Ring. Round 1: Work 6 DC in to the Magic Ring. Join with a SL ST. Round 2: Work 2 DC in to each stitch. 12 sts. Round 3: Work 2 DC in to the first stitch and 1 DC in to the next stitch. Continue this around, 18 sts. Rounds 4 and 5: Work two further rounds of 18 sts in black. You are now going to continue working in red, but first attach the ladybirds eyes. Now join in the red yarn and work a further 7 rounds. Round 13: Work 11 decreases. To decrease pick up the next two stitches/loops, yarn over and pull through all three loops. Stuff the ladybird and then work a final 2 decreases. Finish off and sew in ends, using the tail of the yarn to gather up the remaining stitches and close the hole if need be. Sew two long threads from the back of the black head to the base for the wings, and then either sew the black sequins on for the spots, or embroider spots on if you prefer. To complete the backpack I popped one ladybird in the front pocket and then stitched the second one in place to the front of the bag. 4 Responses to Crochet Club: little backpack! This Back Pack looks adorable! I was searching help on dec row for a back pack pattern on crochetnmore.com – making adjustment to fit my 9 lb chihuaha. Then I clicked on your site and fell in LOVE with this “Little Back Pack” that has embelishment of ladybugs. I simply love this Ladybug Backpack and your other pictures posted. I would really appreciate a print offer for these patterns or a PDF button to save these Fantastic Patterns. Thank you for sharing with us. You can print the web page from your web browser, alternatively you can bookmark the page to go back to at a later date!